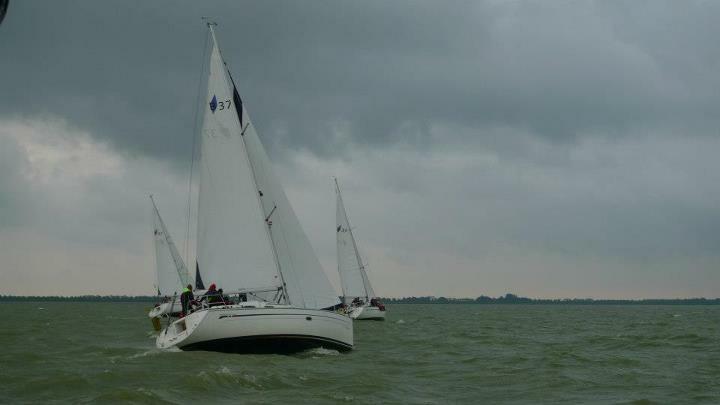 The team from WHU/Kellogg, with representation on board from Columbia won the 3rd Rotterdam School of Management regatta in Lemmer, the Netherlands on the weekend of 24 – 26th August. This is the first victory in the MBA sailing league for the WHU/Kellogg team, who’ve been participating in MBA regattas for over 5 years. Local RSM EMBA 2013 team came in second with LBS in third place. The racing got off to an exciting if expensive start, with winds of 20 – 25 knots on the Saturday, with three boats ripping through their sails in the one race that got underway. The race committee decided to abandon racing for the day after that race, which eventual winners WHU/Kellogg didn’t manage to finish, having blown out their Genoa. RSM EMBA 13 were lying first overnight. On Sunday, the crews got up early for a 5- 6 race day, and the committee managed to get 5 races off in the time that was available. The WHU/ Kellogg team were very aggressive in the starts and managed to hold onto that advantage to finish first in four out of the five races, to be able to discard their DNS in race 1. RSM EMBA 13 were consistent, with two 1s, two 2s a 3 and a 4, while LBS strung togetherfour 3s a 2 and a 4. MBA league champions, Insead could only manage a 7th in the regatta.